Click here to download a PDF of the appendices. Google and Facebook have come to play an extraordinary role in U.S. political campaigns. Both technology companies provide highly valuable consulting services to presidential campaigns free-of-charge, lending them politically-experienced employees to assist with a wide variety of core functions. Having such political staff “embedded” inside campaigns helps both sides. Campaigns get free help targeting and persuading voters; the companies reap valuable intelligence for their lobbying operations and forge relationships with politicians who will be responsible for laws affecting their interests. The practice gives the companies a level of inside knowledge from the campaigns and sway with policymakers few other industries can match. Overall, a review of available evidence suggests that the embed program constitutes a unique, undisclosed, and largely unregulated influence channel that greatly benefits the companies’ business. The novel practice was not foreseen by lobbying rules, which seek to allow the public to see companies’ efforts to influence elected officials. Nor was it contemplated under Federal Election Commission guidelines, which require political candidates to pay for services provided by companies. It raises a host of troubling questions, including whether the corporations are circumventing a ban on donating to campaigns and failing to disclose valuable, “in-kind” contributions. It’s a profitable business. With a virtual duopoly over the digital advertising market, the companies earned a substantial portion of the estimated $1.4 billion that campaigns spent on digital ads in the 2015-2016 election cycle. But the companies are more than passive recipients of campaign dollars. Google employees work inside political campaigns where they are sometimes indistinguishable from campaign hands. These embeds, offered to every presidential campaign in 2016, helped politicians target voters, craft their messages, design their ads, and even respond to opponents during and after political debates. Employees of Google’s YouTube service also consulted with campaigns on the technical aspects of video production, promotion and analytics.Technology company executives working with the campaigns have described a much more expansive role much more akin to full-scale political consultants. In at least some cases, the relationship extended even further. Staffers for Republican candidate Rand Paul travelled to Google’s headquarters in Mountain View, California, to participate in “ideation” sessions. Starting in 2012, Facebook also offered the presidential campaigns dedicated staff to work inside their campaigns.Their role extended far beyond traditional ad sales. Facebook embeds acted as consultants on branding, communications—and overall strategy for the campaign. The embeds have proved highly valuable for both technology companies, giving them unique, insider access to candidates, their evolving policy decisions, and political strategy. The embeds buy both companies hard-to-match goodwill with the politicians they help elect. Our review of LinkedIn profiles found that Google employees often shift between the political ad sales teams and lobbying roles, raising the question of whether internal firewalls exist to stop internal campaign information from reaching company lobbyists. Lee Dunn, Google’s head of international elections outreach, was previously the head of White House outreach. In that role, she lobbied the Trump administration on issues with major implications for the company’s business, such as digital taxes and copyright. Sometimes Google employees worked with campaigns at the same time as they lobbied for Google. Google’s team lead for U.S. politics, Rob Saliterman, said he sold ads to political campaigns while at the same time helping Google’s lobbying arm influence elected officials on policies affecting the company. Between them, Facebook and Google have a phalanx of experienced political hands to deploy to campaigns on both sides of the political divide. That places them in a position to reap the benefits no matter who wins. CfA, relying on LinkedIn profiles, identified 70 Google and YouTube employees and interns whose job responsibilities included political work, as well as 32 Facebook employees that performed this work. In addition, Facebook also hires contractors for its political teams. Many of those hired by Google and Facebook were political insiders. Our analysis showed that nearly 40 percent of Google’s politics and elections staff worked in politics or government before going to the company, and more than 50 percent of Facebook’s politics and elections staff had prior political experience. This level of participation in political campaigns goes far beyond what the tech companies like to advertise. Google says it doesn’t make any corporate contributions to political candidates.However, it doesn’t count any of the services it donates, which, on the open market, might collectively cost tens of millions of dollars. Under Federal Election Commission guidelines, companies are not allowed to offer free services to campaigns if it is different than the commercial rate. Facebook has said the services offered to campaigns are “sales support” and “consistent with support provided to commercial clients in the normal course of business.” But evidence suggests the white-glove service provided to political campaigns by both companies extends well beyond that offered to commercial clients. Job postings for Google’s political positions list responsibilities that include crafting messages and executing strategy for campaigns, for example. Postings for many comparable jobs serving commercial positions do not. Google provides political campaigns with services and digital real estate that commercial clients could not access. 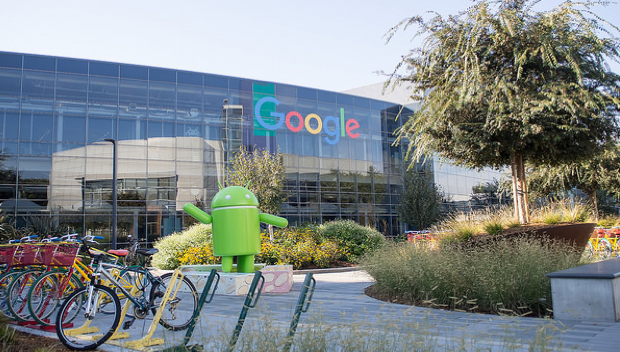 During recent debates, for example, embedded Google employees worked with political campaigns to release extended or clarifying statements through a box at the top of the Google search page, for free. Voters saw those boxes if they searched for political topics during the debates. Those “candidate cards” went beyond public education to provide a valuable form of free advertising for certain candidates. For example, cards for the Donald Trump campaign appeared in Google search results during a primary debate in which Trump declined to participate. The same Google employee who worked with the Trump campaign on its advertising plan also helped it craft the content of its candidate cards during the debates. Other evidence suggests that political ad sales are more than just another business segment for the companies. The political services team of at least one of the companies reportedly had no revenue targets, “in recognition of [its] government affairs role.”One Facebook job posting described its government and politics team as an “external arm” of the company, reinforcing the impression it enjoys a special status beyond its value as a revenue-generating segment. Google and Facebook have compiled sophisticated advertising profiles on nearly every American, information they use to help campaigns target ads to increasingly narrow segments of the population. In 2016, for example, Google for the first time included “left-leaning” and “right-leaning” political views among the targeting criteria available to advertisers in the United States. That reach and impact is why few campaigns would want to risk the companies’ helping their opponent, rather than themselves. During his 2014 campaign for Texas governor, for example, Greg Abbott unilaterally dropped a long-running and acrimonious antitrust investigation into Google that he undertook as Texas attorney general.While no evidence has emerged to suggest the two events were related, Google’s central role in campaigns begs the question: Would a candidate for office wish to be hostile to the interests of Google or Facebook? Other technology companies also provide services to campaigns. Microsoft offers infrastructure like email and data storage, while Twitter also embedded staff in the Trump campaign.Those also raise their own set of issues. In terms of their reach and impact, however, no other companies came close to the value of the services provided by Google and Facebook, nor were they so intimately involved in crafting the political messages different groups of voters heard. “Twitter is how [Trump] talked to the people, Facebook was going to be how he won,” Parscale said on 60 Minutes.Market analysis and leaked internal presentations show that both the Clinton and Trump campaigns also relied heavily on Google during the 2016 election. Google is a frequent presence at gatherings of political professionals. The company often sponsors elaborate lounges at the Democratic and Republican National Conventions, complete with a coffee bar, photo booth, and faux living rooms where users can test Google products. The company was also a “presenting sponsor” at the 2018 Conservative Political Action Conference, where it hosted a party despite pushback from employees on both the right and left. These events help Google brand itself as a political marketing company to attendees who may think of it only as a search company. Google also has a deep bench of employees who are responsible for growing its political business. A survey of LinkedIn profiles identified 70 Google and YouTube employees whose job responsibilities include political work. Employee interviews with Kreiss and McGregor and LinkedIn profiles describe a concierge service for political advertising clients that goes far beyond the services Google advertises on its website. The company started embedding staff in political campaigns in the 2012 presidential election, and the range of services they provided seemed to quickly expand. Rand Paul campaign staff traveled to Google headquarters in Mountain View for “ideation sessions” with Google’s creative team. These “embeds,” who were offered to every presidential campaign, consulted with campaigns on messaging strategy, ad creative, voter targeting, and debate response.The ties between the company and a campaign sometimes went further: Rand Paul campaign staff travelled to California to participate in an “ideation” session at Google’s headquarters. YouTube employees also offered campaigns advice on the technical aspects of video production, promotion and analytics.In 2016, YouTube launched a special template to provide “shot-by-shot guidance” for political ads. YouTube also offers on-site directorial assistance for big-ticket advertisers. Party committees (Republican National Committee, National Republican Senatorial Committee and National Republican Congressional Committee), Political Action Committees (ESA Fund, Senate Leadership Fund, One Nation, Congressional Leadership Fund and others) and right-of-center advocacy groups (National Rifle Association, American Unity Fund, Susan B Anthony’s List and others). One question is whether there are adequate safeguards to prevent Google embeds working on campaigns and outside spending groups from acting as a bridge between them. Campaigns are barred from coordinating with outside groups like super PACs. The LinkedIn data confirmed this claim. Nearly 40 percent of the 70 LinkedIn profiles CfA identified for Google’s politics and elections staff worked in politics or government before coming to Google. Google employees commonly move between political ad sales and public policy team roles within the company. Lee Dunn, Google’s head of international election outreach, was previously the head of the White House outreach, where she lobbied the Trump administration on issues with big implications for the company’s business, such as digital taxes and copyright. Before that, she worked as Google’s primary point person working with Republican campaign committees and conservative groups. The porous boundary between Google’s elections and lobbying groups gives it the ability to influence public officials before they take the oath of office. The porous boundary between Google’s elections advertising and government affairs groups gives it the ability to influence public officials before they even take the oath of office. Google has also recruited politically-active students to serve on its elections team. In 2016, Google hired a team of college students from across the country to act as political advertising interns.The majority of these students were political science or political communication majors, including many who had prior campaign experience. 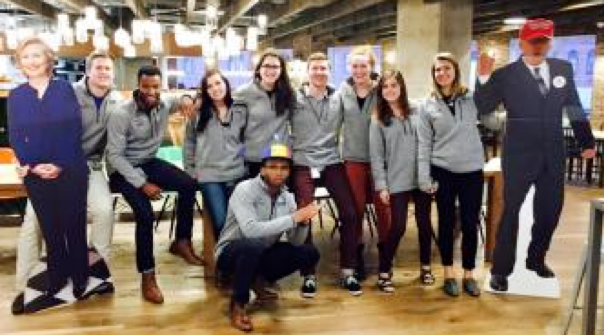 2016 Political Advertising Interns in Google’s Washington, D.C., office. One question is whether this valuable consulting is an illegal in-kind contribution and, if not, whether current rules are adequate for the times. “Generally, if an individual provides services to a campaign during paid working hours, the employer makes a contribution to the campaign,” according to FEC guidance. Google might argue that they provide the consulting because the campaign is buying ads. However, the value of that consulting—separate and apart from the ads—is significant. Presidential campaigns paid tens of millions of dollars for digital consulting during the 2016 cycle, according to FEC data, though opaque and inconsistent reporting makes it impossible to determine exactly how much. For example, the Trump campaign paid its top digital consulting firm, Giles Parscale, $94 million during the 2016 run, though that figure combines ad expenditures with consulting. That continued after the election: The Trump re-election campaign also paid Parscale’s firm $7.4 million between January 2017 to July 2018. FEC data also indicates that Parscale’s firm charges a regular monthly retainer to clients of $10,000 or $15,000 for digital consulting. While the figure likely undercounts the total amount he receives for his work, it does suggest that the two activities—consulting and ad buying—are separable. For more than a decade, Google has offered election season tools that purport to educate voters about the candidates and issues on the ballot. The company sponsors debates, search “widgets” and YouTube channels devoted to political education. In 2007, YouTube partnered with CNN on a pair of debates among the Democratic and Republican presidential primary candidates. The debate sponsors used YouTube to solicit questions from voters as part of Google’s YouChoose ’08 initiative. YouTube debates have since become a fixture of presidential campaigns. In 2016, Google teamed up with Fox News to present a Republican primary debate, and with NBC to present a Democratic primary debate. During recent debates, Google allowed campaigns to release extended or clarifying statements on their candidates’ answers via a widget on the Google search page. Google gave candidates access to this space and allows them to populate “candidate cards” with content for free. Google’s campaign embeds worked with the staff to produce content to populate this space, even suggesting content. Once again, the description of the work conducted by Google’s embedded employees resembles political consulting far more than advertising sales support. Starting in 2012, Facebook offered embeds to every presidential campaign to consult on messaging, ad creation, voter targeting and debate response. The company also provided dedicated staff to political-action committees and advocacy groups. It further refined its political targeting in the run-up to the most recent presidential election. In November 2015, Facebook rolled out its “political influencer” targeting, allowing campaigns to aim their advertisements and posts at politically-active users. Two Facebook staffers joined the 2016 Trump campaign to help develop the most effective advertising and targeting strategy. The embeds spent several days a week at the campaign offices, working with the campaign’s digital team to develop the most effective ads. Facebook’s technology allowed the Trump campaign to run 50,000-60,000 political ads every day. Each ad had slight differences, allowing the campaign to make nuanced adjustments to targeting of audiences as they measured the responses to each ad. To further refine such microtargeting, Trump campaign digital director Brad Parscalehired Cambridge Analytica, a data company that used a method it called “psychographics” to identify narrowly-targeted audiences. (Parscale has denied using the company’s psychological targeting.) Parscale combined efforts from Cambridge Analytica with a database compiled by the Republican National Committee that identified the issues their voters care about. The Trump team spent a reported $70 million on Facebook advertising, using the full gamut of Facebook’s marketing tools and gaining them a reported $250 million in donations. Parscale told the embeds he wanted Republicans from the technology firms sitting in the office to teach him every element of the available technology.Companies like Facebook already had their political teams organized along partisan lines and staffers’ support for a particular candidate, making it easy to deploy to them to campaigns from both parties. Although the Trump campaign ran ads on other platforms, Parscale said that 80 percent of its digital ad buys were on Facebook. The company’s highly sophisticated audience targeting allowed the campaign to reach segmented communities directly, at a fraction of the cost of television ads. Facebook political staff went beyond helping campaigns target their messages, or better use their tools. Increasingly, they helped create the political messages themselves. The expansion of Facebook’s services to campaigns coincided with a shift in the way Facebook sold ads in 2016, including political ads.Rather than having a set price for political ads that would use the company’s highly sophisticated targeting, Facebook auctioned-off the ads using an algorithm that measured bids placed by various companies or campaigns, echoing the model Google built for its ad auctions. Facebook has a piece of ad real estate that it’s auctioning off, and potential advertisers submit a piece of ad creative, a targeting spec for their ideal user, and a bid for what they’re willing to pay to obtain a desired response (such as a click, a like, or a comment). Rather than simply reward that ad position to the highest bidder, though, Facebook uses a complex model that considers both the dollar value of each bid as well as how good a piece of clickbait (or view-bait, or comment-bait) the corresponding ad is. If Facebook’s model thinks your ad is 10 times more likely to engage a user than another company’s ad, then your effective bid at auction is considered 10 times higher than a company willing to pay the same dollar amount. Mark Zuckerberg said only that Facebook offered “sales support” to all campaigns. During his testimony, Zuckerberg was evasive on the issue, saying only that the company offered “sales support” to all campaigns. Facebook later responded in more detail, adding that the service it offered to campaigns was no different from support offered to other, non-political accounts. “[F]or candidates across the political spectrum, Facebook offers the same levels of support in key moments to help campaigns understand how best to use the platform,” the company wrote in its response. “Facebook representatives advise political advertisers on Facebook, as they would with other, non-political managed accounts. During the 2016 election cycle, Facebook worked with campaigns to optimize their use of the platform, including helping them understand various ad formats and providing other best practices guidance on use of the platform. No one from Facebook was assigned full-time to the Trump campaign, or full-time to the Clinton campaign. We offered identical support to both the Trump and Clinton campaigns, and had teams assigned to both. Everyone had access to the same tools, which are the same tools that every campaign is offered. The campaigns did not get to “hand pick” the people who worked with them from Facebook. Both campaigns approached things differently and used different amounts of support. We continuously work to ensure that we comply with all applicable laws and policies. We have a compliance team that trains our sales representatives to comply with all federal election law requirements in this area. Facebook employees are encouraged to raise any concerns about improper activity to their managers. While our investigation is ongoing, our review indicates that Facebook employees did not identify any issues involving the improper use of Facebook data in the course of their interactions with Cambridge Analytica during the 2016 US Presidential campaign. However, descriptions of the work conducted by Facebook’s embeds and political staff suggest the work goes beyond that conducted for regular, commercial clients. In many cases, it seems closer to that of digital consultants for the campaigns, which could cost millions of dollars over a campaign cycle and would not likely have the same access to Facebook’s data or systems. In interviews with academics, Facebook executives struggled to define their role. Katie Harbath, Facebook’s global politics and government outreach director, described it as an “advisory role.” Facebook’s liaison to the Clinton campaign, Crystal Patterson, seemed to emphasize providing creative ideas over simple advice on the mechanics of digital advertising. “Sometimes we’re just here to bounce ideas off, and kind of get them out of the, what’s our e-mail schedule, what’s our digital schedule, you know the mechanics…. Sometimes overtake the fun part, and so we try to introduce some of that creativity and fun back into it.…,” said Patterson. Facebook continues to expand its role in U.S. and foreign elections despite the controversy over its role in spreading misinformation by Russia during the 2016 election and the misuse of user data by Cambridge Analytica. In particular, Facebook continues its aggressive recruitment of political operatives to deploy in campaigns. A survey of Facebook job postings available in the Internet Archive through 2016 showed that the positions handling political accounts are referred to as “Client Solutions Managers,”“Client Partners,”or “Account Managers”. In 2015, Facebook began advertising for politically-focused positions by party affiliation, according to an analysis of archived Facebook sales jobs. Facebook jobs postings in 2015 listed by political party affiliation available in the internet archive. A job with same title and description but for the Republican Party was also being advertised. The Google Transparency Projectrelied on LinkedIn data, analyzing profiles for Google and Facebook employees, to build a database of employees for both companies that worked with political campaigns. The database for each company is attached to this report. Archived marketing materials for political clients, job descriptions, and industry publications also provided source material for this report. For direct testimonies from Google and Facebook campaign staff, GTP relied on the work of Daniel Kreiss and Shannon C. McGregor whose paper “Technology Firms Shape Political Communication” was published in Political Communicationin October 2017. Their paper is cited throughout this report. Kate Kaye, Election Embeds: Facebook, Google Got Cozy With Campaigns, AdAge, December 10, 2012, available athttp://adage.com/article/digital/election-embeds-facebook-google-cozy-campaigns/238693/. Kate Stanford, How Political Ads and Video Content Influence Voter Opinion, Google, March 2016, available athttps://www.thinkwithgoogle.com/marketing-resources/content-marketing/political-ads-video-content-influence-voter-opinion/. Sean J. Miller, Digital Ad Spending Tops Estimates, Campaigns & Elections, January 4, 2017, available athttps://www.campaignsandelections.com/campaign-insider/digital-ad-spending-tops-estimates; Matthew Garrahan, Google and Facebook Dominance Forecast to Rise, Financial Times, December 3, 2017, available at https://www.ft.com/content/cf362186-d840-11e7-a039-c64b1c09b482. Daniel Kreiss and Shannon C. McGregor, Technology Firms Shape Political Communication: The Work of Microsoft, Facebook, Twitter, and Google With Campaigns During the 2016 U.S. Presidential Cycle, Political Communication, October 26, 2017, available athttps://danielkreiss.files.wordpress.com/2018/01/kreissmcgregortechnology-firms-shape-political-communication-the-work-of-microsoft-facebook-twitter-and-google-with-campaigns-during-the-2016-u-s-presidential-cycle.pdf;Nancy Scola, How Facebook, Google and Twitter ‘Embeds’ Helped Trump in 2016, Politico, October 26, 2017, available athttps://www.politico.com/story/2017/10/26/facebook-google-twitter-trump-244191. Kreiss and McGregor, Political Communication, Oct. 26, 2017; https://www.linkedin.com/in/clark-jacob/. Kaye, AdAge, Dec. 10, 2012. Kreiss and McGregor, Political Communication, Oct. 26, 2017; Scola, Politico, Oct. 26, 2017. Kreiss and McGregor, Political Communication, Oct. 26, 2017, pg. 21. Alex Hern, Mark Zuckerberg Appears Before European Parliament – As It Happened, The Guardian, May 22, 2018, available athttps://www.theguardian.com/technology/live/2018/may/22/mark-zuckerberg-facebook-appears-before-european-parliament-live-updates. Kreiss and McGregor, Political Communication, Oct. 26, 2017. Appendix A: Google’s Elections Team; Appendix B: Facebook’s Elections Team. Appendix B: Facebook’s Elections Team. https://www.fec.gov/help-candidates-and-committees/candidate-taking-receipts/volunteer-activity/;https://www.fec.gov/help-candidates-and-committees/making-disbursements-pac/making-kind-contributions-candidates/; Press Release, Rep. John Sarbanes, Top Democrats Press Mark Zuckerberg for More Information about Facebook’s Role in American Democracy, April 25, 2018, available athttps://sarbanes.house.gov/media-center/press-releases/top-democrats-press-mark-zuckerberg-for-more-information-about-facebook. Letter from Facebook to House Energy and Commerce Committee, June 29, 2018, available athttps://democrats-energycommerce.house.gov/sites/democrats.energycommerce.house.gov/files/documents/House%20QFRs.compressed.pdf. Kreiss and McGregor, Political Communication, Oct. 26, 2017; Danielle Bowers, New Ways to Stay Informed About Presidential Politics, Google, February 26, 2016, available athttps://blog.google/topics/politics-elections/republican-debate-presidential-politics/. Danny Sullivan, New US Presidential “Candidate Cards” Are a Disaster for Google’s Search Quality, Search Engine Land, January 28, 2016, available athttps://searchengineland.com/new-us-presidential-candidate-cards-241337. Kreiss and McGregor, Political Communication, Oct. 26, 2017, pg. 7. Sarah Frier and Bill Allison, Facebook ‘Embeds’ Helped Trump Win, Digital Director Says, Bloomberg, October 6, 2017,available athttps://www.bloomberg.com/news/articles/2017-10-07/facebook-embeds-helped-trump-win-parscale-tells-60-minutes. Rich McCormick, Donald Trump Says Facebook and Twitter ‘Helped Him Win’,The Verge, November 13, 2016, available athttps://www.theverge.com/2016/11/13/13619148/trump-facebook-twitter-helped-win. Hanna Kozlowska, Facebook and Cambridge Analytica Worked Side by Side at a Trump Campaign Office in San Antonio, Quartz, March 20, 2018, available athttps://qz.com/1233579/facebook-and-cambridge-analytica-worked-side-by-side-at-a-trump-campaign-office-in-san-antonio/. Alex Kantrowitz, Facebook’s 2016 Election Team Gave Advertisers A Blueprint To a Divided US, BuzzFeed, October 30, 2017, available athttps://www.buzzfeed.com/alexkantrowitz/facebooks-2016-election-team-gave-advertisers-a-blueprint. Security​ ​and​ ​Disinformation​ ​in​ ​the​ ​U.S.​ ​2016​ Election:​ ​What​ We​ Found,Google, October 30, 2017, available at https://storage.googleapis.com/gweb-uniblog-publish-prod/documents/google_US2016election_findings_1_zm64A1G.pdf. Luke Mullins, Ted Cruz’s Texas Two-Step: Hired Gun for Google, Yahoo, March 6, 2015, available athttps://www.yahoo.com/news/when-google-hired-ted-cruz–was-it-lawyering-or-lobbying-224937497.html; Texas v. Google Inc., Case No. D-1-GV-12-000887, available athttps://www.traviscountytx.gov/district-clerk/online-case-information; Brian Womack, Google Gobbles Up More Companies, Cape Times, July 28, 2014. Lesley Stahl, Facebook “Embeds,” Russia and The Trump Campaign’s Secret Weapon, 60 Minutes, June 10, 2018, available athttps://www.cbsnews.com/news/facebook-embeds-russia-and-the-trump-campaigns-secret-weapon-60-minutes/. Data and Digital Marketing Debrief: Trump for President, Cambridge Analytica, available athttps://www.scribd.com/document/374672745/Cambridge-Analytica-s-Trump-for-President-debrief; Jayson DeMers, Donald Trump vs. Hillary Clinton: Who’s Winning At Online Marketing, Forbes, July 28, 2016,available athttps://www.forbes.com/sites/jaysondemers/2016/07/28/donald-trump-vs-hillary-clinton-whos-winning-at-online-marketing/#1d13c15d13f8; Tim Fernholz, Hacked Emails Show Eric Schmidt Played a Crucial Role in Team Hillary’s Election Tech, Quartz, November 1, 2016, available athttps://qz.com/823922/eric-schmidt-played-a-crucial-role-in-team-hillarys-election-tech/. The Corporate Invasion: DNC, RNC as Google Hang Out, Reading the Pictures, September 4, 2012, available athttps://www.readingthepictures.org/2012/09/the-corporate-conventions-dnc-rnc-as-google-hang-out/; Owen Thomas, Google Has Used Shipping Containers To Build A Big Presence At The Democratic National Convention, Business Insider, September 4, 2012, available athttp://www.businessinsider.com/google-shipping-containers-dnc-charlotte-2012-9. Allum Bokhari, Exclusive: Left-Wing Google Employees Urge Company to Disavow CPAC Over ‘Ethno Nationalism,’ ‘Hate’, Breitbart, March 9, 2018, available athttp://www.breitbart.com/tech/2018/03/09/exclusive-left-wing-google-employees-urge-company-to-disavow-cpac-over-ethno-nationalism-hate/; Michael M. Grynbaum and John Herrman, New Foils for the Right: Google and Facebook, The New York Times, March 6, 2018, available athttps://www.nytimes.com/2018/03/06/business/media/paul-schweizer-google-facebook.html. See Appendix A: Google’s Elections Team. Sara Snyder, Meet the YouTube Directors Apps Newest Template: Elections,Google, October 8, 2016, available athttps://blog.google/topics/politics-elections/meet-youtube-directors-app-newest-template-elections/. Rachael Marcus and John Dunbar, Rules Against Coordination Between Super PACs, Candidates, Tough to Enforce, Center for Public Integrity, January 13, 2012, available athttps://www.publicintegrity.org/2012/01/13/7866/rules-against-coordination-between-super-pacs-candidates-tough-enforce. Lucy Handley, Trump’s Digital Campaign Director Was Paid $1,500 to Set up His Election Website. Then He Raked in $94 Million When Trump Won, CNBC, October 9, 2017, available athttps://www.cnbc.com/2017/10/09/donald-trumps-digital-campaign-directors-company-paid-94-million.html. Donald J. Trump For President, Inc., Disbursements to Parscale Strategy LLC, Federal Election Commission, 2018 Election cycle, available at https://www.fec.gov/data/disbursements/?two_year_transaction_period=2018&data_type=processed&committee_id=C00580100&recipient_name=parscale&min_date=01%2F01%2F2017&max_date=07%2F20%2F2018. All Disbursements to Parscale Strategy LLC, Federal Election Commission, 2018 Election cycle, available at https://www.fec.gov/data/disbursements/?two_year_transaction_period=2018&data_type=processed&recipient_name=parscale&min_date=01%2F01%2F2017&max_date=07%2F20%2F2018. Announcing the CNN/YouTube Debates, YouTube, June 14, 2017, available athttps://youtube.googleblog.com/2007/06/announcing-cnnyoutube-debates.html. Steve Grove, Google and FOX News Channel Present Republican Presidential Debate in Des Moines, Iowa, Google, January 21, 2016, available athttps://blog.google/topics/politics-elections/google-and-fox-news-channel-present/; Brandon Feldman and Steve Grove, YouTube and NBC News Present Democratic Primary Debate in South Carolina, YouTube, December 16, 2015, available at https://youtube.googleblog.com/2015/12/youtube-and-nbc-news-present-democratic.html. Bowers, Google, Feb. 26, 2016. Kaye, AdAge, Dec. 10, 2012; Kreiss and McGregor, Political Communication, Oct. 26, 2017. Sean J. Miller, New Facebook Tool Allows Mail-Style Targeting, Campaign s& Elections, November 11, 2015, available athttps://www.campaignsandelections.com/campaign-insider/new-facebook-tool-allows-mail-style-targeting. Noah Kulwin, Team Trump Had at Least 8 Silicon Valley Embeds, Vice News, October 31, 2017, available athttps://news.vice.com/en_us/article/8xmvkg/trump-campaign-had-help-from-8-silicon-valley-staffers. Stahl, 60 Minutes, Jun. 10, 2018. Matea Gold and Elizabeth Dwoskin, Trump Campaign’s Embrace of Facebook Shows Company’s Growing Reach in Elections, Washington Post, October 8, 2017, available athttps://www.washingtonpost.com/politics/trump-campaigns-embrace-of-facebook-shows-companys-growing-reach-in-elections/2017/10/08/e5e5f156-a93b-11e7-b3aa-c0e2e1d41e38_story.html; Issie Lapowsky, Here’s How Facebook Actually Won Trump the Presidency, Wired, November 15, 2016, available athttps://www.wired.com/2016/11/facebook-won-trump-election-not-just-fake-news/. Samantha Foon, An Insider Look at Reach and Frequency Ad Buying on Facebook,Ignite Social Media, June 23, 2018, available athttps://www.ignitesocialmedia.com/social-advertising/reach-frequency-ad-buying-facebook/. Antonio Garcia Martinez, How Trump Conquered Facebook – Without Russian Ads,Wired, February 23, 2018, available athttps://www.wired.com/story/how-trump-conquered-facebookwithout-russian-ads/. Letter from Facebook to House Energy and Commerce Committee, June 29, 2018, pg. 662-670. 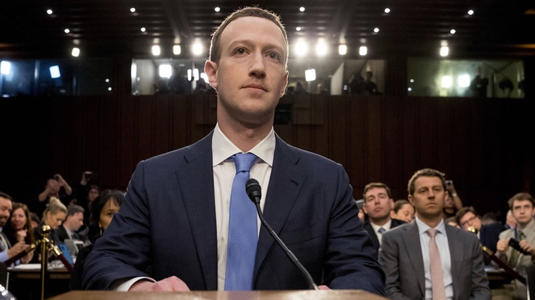 Zuckerberg Faces House in Second Day of Facebook Testimony—Live Analysis, Wall Street Journal, April 12, 2018, available athttps://www.wsj.com/livecoverage/facebook-mark-zuckerberg-live-coverage/card/1523469372. Letter from Facebook to House Energy and Commerce Committee, June 29, 2018. Lauren Etter, Vernon Silver, and Sarah Frier, How Facebook’s Political Unit Enables the Dark Art of Digital Propaganda, Bloomberg, December 21, 2017, available athttps://www.bloomberg.com/news/features/2017-12-21/inside-the-facebook-team-helping-regimes-that-reach-out-and-crack-down. https://web.archive.org/web/20140103185049/https://www.facebook.com/careers/teams/sales; https://web.archive.org/web/20130605043002/https://www.facebook.com/careers/department?dept=sales&req=a0IA0000006cQhdMAE;https://web.archive.org/web/20130514222649/https://www.facebook.com/careers/teams/sales;See Appendix C: Facebook’s Elections Jobs Board. https://web.archive.org/web/20150530121643/https:/www.facebook.com/careers/teams/sales/;See Appendix C: Facebook’s Elections Jobs Board.